Just Because We CAN Do It All, SHOULD We? Exhausting, right? This campaign was empowering and exciting to me as a kid. 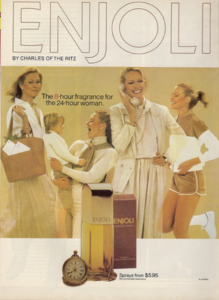 I wanted to BE the Enjoli woman–smart, accomplished, social, a loving mom and gorgeous wife. It never occurred to me that this woman would possibly also be exhausted, over stimulated, and (to quote “Shrek”) a donkey on the edge! 24 hour woman!?!?! What kind of total BS is this? 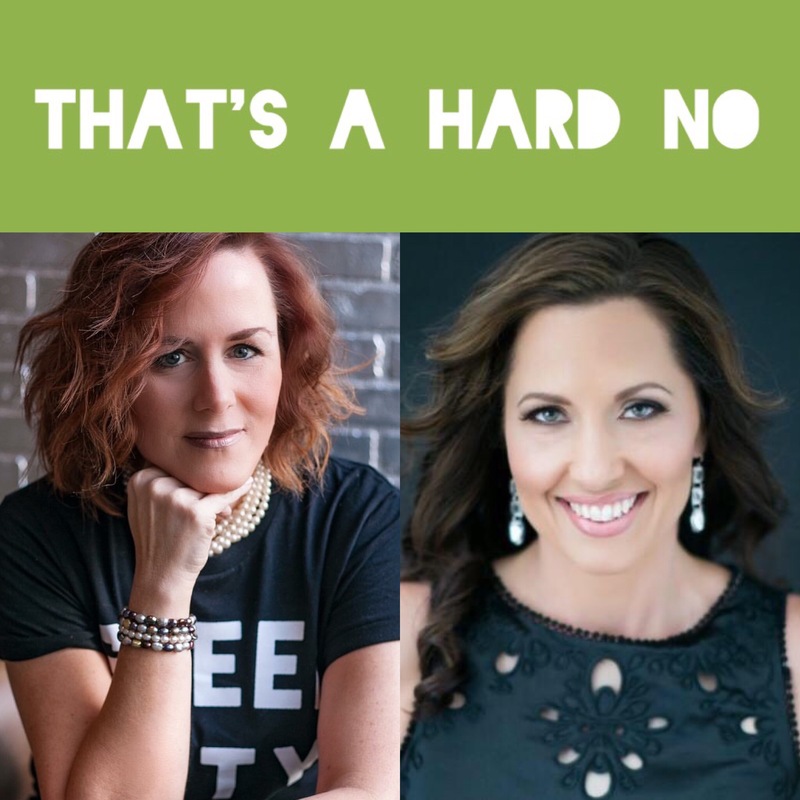 Recently, my friend Dr. Amy Cannatta and I had a long discussion about chronic fatigue. She sees the results of our lifestyle played over and over in her practice. We asked each other how we keep some semblance of balance (we surmised that it really doesn’t exist, but we will get to why in another installment), and realized we really don’t. We are YES women. The saying goes, “If you want something done, find the busiest person you know.” I completely agree. But imagine, for just a moment, you ARE this person. You have multiple balls in the air, UBER mom or dad, and then you get sick. Or your parents get sick. Or there’s a huge emergency with a friend or child (god forbid). What is your safety net? Can you easily delegate some tasks, or will ALL the balls drop? Amy and I plan to explore what type of person does this, how to make some changes, what are the long-term health indications of chronic fatigue, and how to take back your schedule, find the down time, and GET RID OF THE GUILT OF SAYING NO. That said, WE are also works in progress. We are working these steps and learning right along with YOU. First things first–we needed to collect some data (my GOD, I’ve LITERALLY never been so scientific in MY LIFE. You all must be very important). Hopefully you had a chance to take the survey we published on Moxie Mama (or the newsletter). Demographics: Almost 100% were women. I had two guys complete the survey, but they didn’t seem too happy about over work regardless. 87% have children–also showing that it does NOT take being a parent to feel overwhelmed in obligation. Interestingly, 67% consider themselves extroverts. As a self-proclaimed “extrovert on steroids,” I did feel like this may prove to be consistent with folks who have a harder time saying NO. Why? FOMO (the fear of missing out, for the uninitiated). The idea that extroverts gain energy from social situation would subject them from not wanting to miss out on something, whether a social obligation, helping friend, whatever. 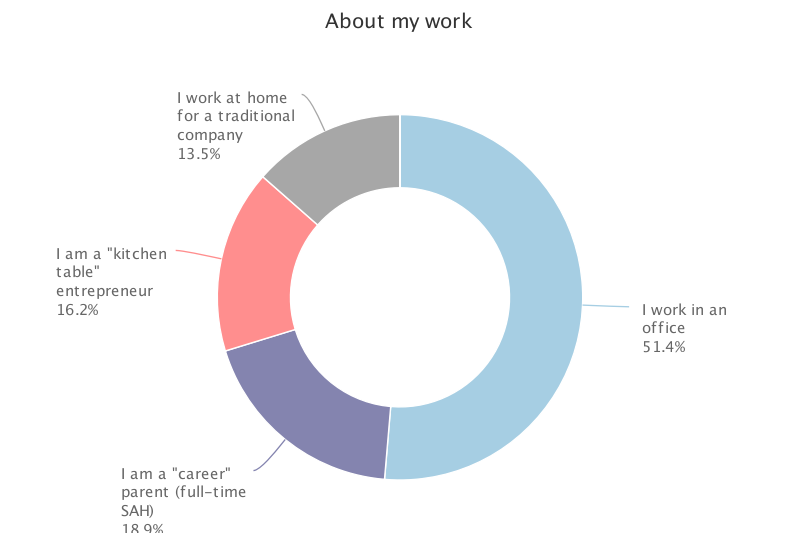 The most important demographic to cover is shown here: 82% of us work, but the career parents are not immune to chaos! Full-time, part-time, work from home, building your own business, or raising your kids–doesn’t matter! We all, at least sometimes, feel like we have taken on too much. I followed up with a couple people who work at an office. 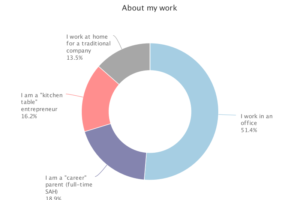 As a work-FROM-home, I feel that I’m TOO available (in perception) for carpools, emergencies, etc. I figured that the physical impediment of being in the office would actually HELP my condition. WRONG! I learned quickly that the GUILT of these folks when they have to ask for help is through the roof. That’s not right, either. 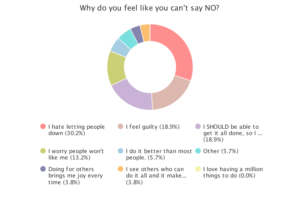 Work and KIDS are the top guilt-inducers to saying no. 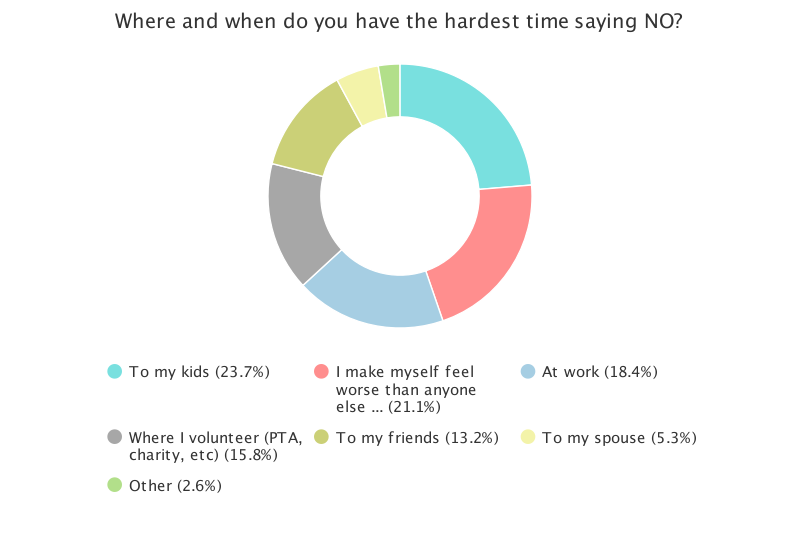 Our obligations to volunteerism tug heavily at us. The most disturbing answer: “I make myself feel worse than anyone else.” This affected me deeply because it seems we all have a deep-rooted fear of failing lingering under the surface. Encouraging was the spouse answer. It is important, if married, to have a spouse who understands that things are overwhelming and it’s safe to say NO to additional obligations. YAY! 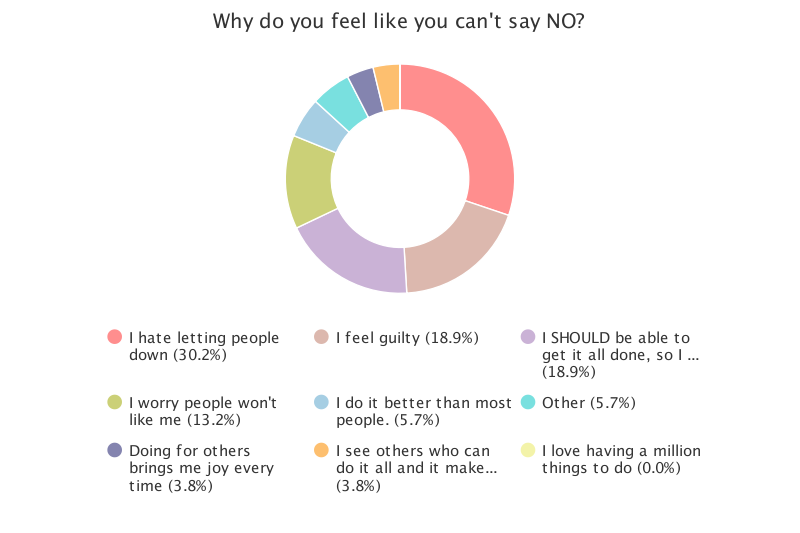 When asked WHY we feel like we cannot say NO, the theme is I “should” be able to, I hate letting people down, I feel guilty. Does this ultimately link back to Ms. Enjoli? Were we raised to think it should be easy, I should count my blessings, I can do it all? Ultimately, NOT ONE PERSON said they are always happy to do that “one more thing.” Reports of resentment, sadness, anger were all listed and I had several email me separately to define their “other” answer. SICK (yes, actually physically sick) was what those folks told me. I get it, I’m the same. But when I look at it, in writing, I wonder WHY we all ignore our GUTS and say yes anyway. Is our fear of disappointing people really worse than our own health? I’d take this back to what happens if this catches up and we really end up ill? What happens to this juggling act without a plan of balance. The plan Amy and I have for us and YOU is digging into the physical, emotional ramifications, but most importantly the modifications necessary for balance, listening to yourself when it happens, and keeping this boundary sacred. In the past year, I gave up a full-time position to affect a change in my life. I recognized that I have a mere two years before my eldest leaves home for college, and four for both. Remember running down a hill as a kid and feeling like you couldn’t possibly stop? Yeah, that’s what it feels like. I had to put the brakes on to protect OUR time and be there for them at a really critical time. I’m lucky that I could. Let me say that again: I am LUCKY that I COULD. It is not realistic to assume that anyone who wants to make a career change like this CAN, but it is what worked for ME. I was losing sleep trying to keep up. I realized I was no longer willing to sacrifice my health nor family and made a change. Did you notice anything about that last sentence? There’s a word that is CRITICAL to this….WILLING. Yes, “NO” is a complete sentence, but we tend to qualify why we cannot out of guilt. Here’s a tip from a career sales person: those verbal justifications minimize your NO and open the door to negotiations. Why do you think OUR parents all said “BECAUSE I SAID SO” when pushed? For those of you joining us on this journey, I issue this challenge: the next time you are asked to take on another project or do a favor or drop your kids’ forgotten homework off, ask yourself if you are WILLING TO do it? Because yes, you can. You are strong, caring, educated, and capable. But are you WILLING? Change the conversation in your head FIRST and we will get to the rest in upcoming articles! Please send us your thoughts, comments, and what you’d like to learn more about! Email back to sam@moxiemama.tv with a subject of “That’s a HARD NO” so we know it’s about the series! Great read.As a working mom who has over committee herself for the past 19 yrs, I have vowed that this year will be different! Hope to stick to my guns and say NO! Keep it going! We have lots more to share but saying NO more often allows us to say YES to the things we really want to, right? It's a process and I'm 47 and still figuring it all out. Thanks for your feedback!